An Yves Klein for the Instagram generation, the New York-based Mr. Smith uses a fire extinguisher to spray canvases with thousands of droplets of paint. He has produced as many as 300 of his “rain” paintings over the last couple of years, dealers estimate. Schachter is surely right. And it is worth adding that Hirst’s Spots, Murakami’s flowers and Koons’s nearly 5000 small balloon dogs have paved the way for the big series. 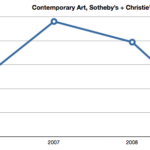 The steadily rising value of those little balloon dogs (one of which sold for $52,000 late last year as the rest of the series has maintained a fairly steady $10-12k value) suggests the art market needs works in larger series to be able to span the global demand.